Once upon a time, oh about a decade and a half ago, Dave Chappelle was on top of the world. He had a popular show on Comedy Central that was must-see TV. Chappelle's Show made its creator a pop culture phenomenon. His show was such a hit, Comedy Central gave him a new $50 million contract to make more. And then he walked away. No one understood it at the time and it shocked the world. We'll get back to that in a moment. For now we'll just tease you with this: Dave Chappelle is back and he's back in a big way. Twelve years after he walked off his eponymous Comedy Central series, Chappelle has returned to the mainstream spotlight and is keeping it current with a Netflix deal for three comedy specials. The first two – which each came with an eight-figure check – were Netflix's most-watched stand-up specials ever, according to the streaming service. Dave Chappelle was born in Washington, D.C. in 1973 and grew up in Silver Spring, Maryland. His parents were college professors and were politically active. Chappelle knew early on that he wanted to pursue comedy and was inspired by Eddie Murphy and Richard Pryor. After he finished school, he moved to New York City to become a comedian. He was booed off the stage of the Apollo Theatre in Harlem during an Amateur Night event, but he didn't let that stop him. He quickly made a name for himself on the New York comedy circuit after that. When he was 19, he made his film debut in the Mel Brooks film Robin Hood: Men in Tights. That same year, he was the opening act for Aretha Franklin's tour. Throughout the 1990s, Chappelle had a number roles on sitcoms and in feature films including Eddie Murphy's 1996 film The Nutty Professor. In 1998, he co-wrote the cult stoner movie Half Baked. It was his first starring role. That same year, he taped a 30 minute HBO comedy special and appeared in the movie You've Got Mail. By 2000, he was taping an hour long HBO special. In 2003, Chappelle debuted his Comedy Central show. His profile had been steadily rising for a decade, but it was Chappelle's Show that put him over the top into superstardom. The sketch comedy show ran for three seasons, but he knew it was driving him crazy by 2004. Chappelle told one of his stand-up audiences that the show was ruining his life. He hated constantly hearing his famous catchphrases. "There's not too many people that don't think I'm crazy. So I look at it like this: I'm at a restaurant with my wife. It's a nice restaurant. We're eating dinner. I look across the room and I say, 'You see this guy over here across the room? He has $100 million. And we're eating the same entree. So, OK, fine, I don't have $50 million or whatever it was, but say I have $10 million in the bank. The difference in lifestyle is minuscule. The only difference between having $10 million and $50 million is an astounding $40 million. Of course I would like to have that money… There's nothing anyone can say. It's just you do what you feel like you need to do… I've felt a variety of ways in the last 10 years. You know, whenever there's something that I'd like to have that I could've afforded that I can't now afford, well then I'm upset about it." "Money is the fuel for choices. Money gives me choices. That's not nothing, that's something. I can choose where my kids go to school, I can choose what I want to eat in a given day. But it's not the end all be all. There are other things in my life that I did not purchase with money that are very valuable." So Dave Chappelle walked away from his successful series and his giant $50 million contract, took off to South Africa, and faded from the public eye for YEARS. People were shocked. They wondered what happened to him. They wondered what was wrong with him. And then they forgot about him. Several years ago, Chappelle started quietly doing stand-up gigs again. Over time, he did more. They got bigger. People wondered if he was back. From 2013 to 2016 he performed more than 500 shows. Many of those shows sold out within minutes of going on sale. Then, in 2016 he hosted Saturday Night Live and it went well. The next morning all the water cooler talk was about his monologue, in which he addressed how he was feeling after the U.S. Presidential election. That episode of SNL delivered the highest overnight ratings and the best 18-to-49-ratings for the show since 2013. He won an Emmy just this week for that hosting appearance. Suddenly, Dave Chappelle was relevant again. Netflix came calling. They wanted him to do three comedy specials with them to air in 2017. For that, they would pay the comedian $60 million. Chappelle walked away from a Comedy Central deal in 2005 worth $50 million. His new Netflix deal gave him $10 million more reasons to be funny. Dave Chappelle made $47 million in the past year, making him the 43rd highest-paid entertainer of the year. He has a net worth of $42 million. Dave Chappelle is back, in a big way. There's a very simple reason Dave Chappelle surprised fans with two Netflix comedy specials last night: MONEY. 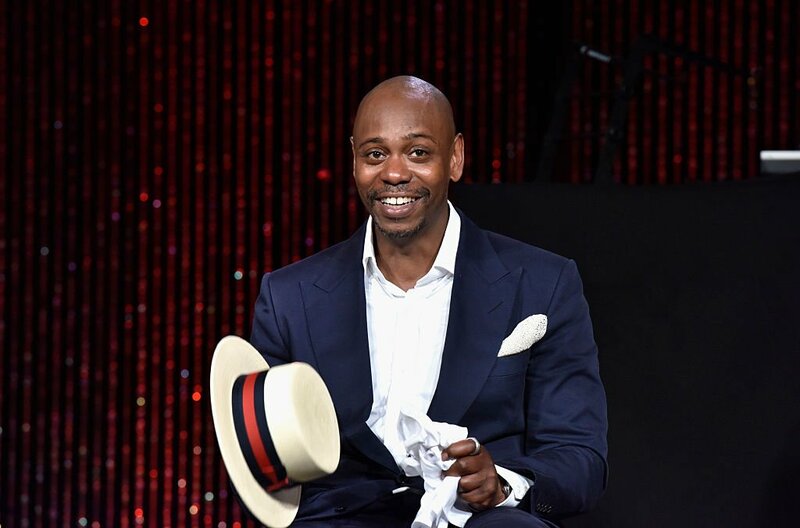 Fresh off a successful stint hosting Saturday Night Live, funny man Dave Chappelle has inked a MASSIVE new deal for three Netflix comedy specials.